Why Sydney’s Martin Place has not been the subject of earlier research and investigation might appear to be a mystery. Hasn’t it always been there and isn’t it just a street? 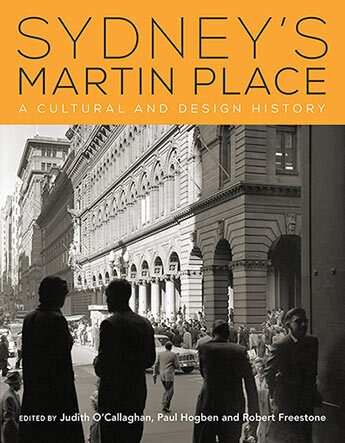 This book explains Martin Place’s beginning, its development and its current condition. The stories presented in this comprehensive, if architecturally influenced book are well compiled and carefully juxtaposed by the editors. The architectural and design focus of the 14 chapters reflects clearly the editors’ connection with the University of New South Wales Faculty of the Built Environment. The Faculty can trace its origins back to the 1950s, when the Sydney Technical College diploma course and the newly created degree course in architecture moved from Ultimo to Kensington. The Faculty now has courses in architecture, building construction and property management, town planning, landscape architecture, interior design, industrial design and computer design. The application of this extensive range of expertise is evident in this publication. The book’s chapters each focus on a particular quality, or characteristic of Martin Place. These are primarily its design, its role and function and its cultural use. The Place, as we now know it, was completed only in the latter half of the 20th century. Peter Kohane and Mark Stiles deal with early history and show that the late 19th century version of the Place was only one block long between George and Pitt Streets, in front of Colonial Architect James Barnet’s GPO. 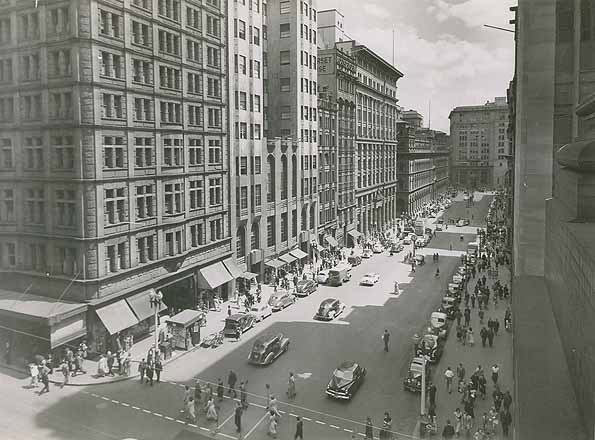 Robert Freestone takes us through the travails of bringing the Place to its full extent from George Street to Macquarie Street, the fully trafficked street not being realised until 1935. Martin Place is also the principal cultural and social centre of Sydney. Charles Pickett describes activities that took place here during and between the two world wars. These included recruiting, the promotion of national policies and presentation of political messages. It commenced functioning as a place for reflection and commemoration of a nation’s sacrifice when the Cenotaph was erected in 1929. It was also the site for celebration when people took it over from the motor car on VJ day in August 1945. Shirley Daborn describes the role that illustrations of Martin Place played to promote Sydney to the nation and the world; her selection of illustrations and photos is most effective. The prestige land uses adjacent to the public road and pedestrian area are most comprehensively dealt with by Michael Bogle, Sing D’Arcy, Russell Rodrigo, Paola Favaro, and Harry Margalit. The design and construction of banks and insurance companies, always good companions attracted to GPOs to access the latest news, set the stage for Martin Place becoming Sydney’s financial centre. The descriptions of the design and construction of these buildings are most informative, including precise references to the hurdles needed to be surmounted by owners, architects and builders. To be seen in Martin Place, and to have one’s photograph taken by predatory photographers in the 1930s and 1940s, was a common activity and aspiration. Paul Hogben recalls memories (for those of us old enough) of the quiet prestige, plushness and delights of Romano’s, Prince’s and Cahill’s restaurants, and the noisy boisterousness at six o’clock when patrons from the Australia Hotel bar spilled onto the street. However, it is left to Judith O’Callaghan, Maryam Gusheh, Katrina Simon and Dijana Alic to bring the Place into the present day as a transportation hub and pedestrian plaza with all its contemporary activities. In particular, it is most interesting to read the interviews with Don Gazzard, Nicholas Tesdorf and Darrel Conybeare concerning the pedestrianisation of Martin Place. Catherine Lassen focusses on the perennial tension between progress and conservation, describing the good – conserving the State Savings Bank and the Commonwealth Bank – and the bad – demolishing the Rural Bank, the unsympathetic adaptation of the GPO to a hotel. All these stories are well told, eminently readable and delightfully presented with attractive illustrations, photographs and plans. There is even reference to students from Sydney University targeting the underground men’s toilet located under the clock in the middle of Martin Place for their commemoration day pranks. However, the location of Moore Street, a lane eventually widened to extend the Place from Pitt Street to Castlereagh Street, is somewhat illusive because there is no map which shows it. Lucy Turnbull sums up the book as a description of the ever-changing nature of the history, creation and evolution of Martin Place, a place of celebration and centre of finance. She hints that further change is inevitable, as does Catherine Lassen. The extent of the research which went into the writing of the book is reflected in the quality of the reference notes. Since the UNSW Faculty of the Built Environment is able to bring the history, the different characteristics and qualities of Martin Place together so well, perhaps it should seek out other interesting sites to shine its research light upon. * Grahame Crocket is an architect and town planner who has advised on the assessment and management of heritage places. He recently contributed to the ‘Outback and beyond’ issue, vol. 28, no. 1, 2016, of Historic Environment, by Australia ICOMOS (International Council on Monuments and Sites).